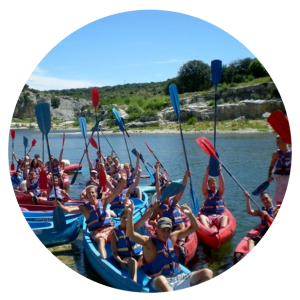 Specialised in the rental of canoes and kayaks, via ferrata gears and now offering multi activities packs in Collias and the surroundings, we are committed to providing you with a world class service! Our family company has been established for more than 30 years by enthusiasts of canoe and nature. Our team is constituted by a professional permanent employees and seasonal workers. Over the years, we’ve participating in diverse big sports events and were so able to develop our capacities with the groups while preserving the strength in the reception of families and private individuals. This year, we made every effort to satisfy you and have the pleasure to present exclusive new services intended to complete your canoeing or and your day of leisure activities. Thereby, we hope to answer the expressed requests and keep an excellence in quality! Committed in the protection of our natural and historic heritage, we chose to make little changes in our everyday company life and chose to direct new activities for the groups and the families on the culture, the environment and the sport so that each one finds what he/she is looking for. • NEW AREA FOR PICNIC, when waiting becomes practical, fun and good for parents too! •New products for snack and drinks and a local-organic pic-nic basket on order. We wish you an excellent day on the river with Canoe le Tourbillon! The one you will meet at the desk or driving the bus or helping you out with your equipment... or simply welcome you with a canoe in a hand! It’s him..
Answer to your specific questions on the organization of your event, or your family outing, make a quotation... it’s her! Walk around nature and pont du Gard to share the passion of environment , it’s her too! And if you see a person walking with the full hands and a telephone to the ear.. certainly her!